We offer Business continuity management system - ISO 22301 certification consultancy for manufacturing and service industries. We are having many clients who have successfully developed business continuity management system with our readymade ISO 22301 documentation kit. Our BCMS Consultancy includes step-by-step implementation of BCMS system, awareness, auditor training, ISO 22301 documentation and internal audit, which has helped many organizations to achieve this value-added certification. The ISO 22301:2012 Certification can be achieved by effective micro-level survey of the existing system and conducting awareness program (top + middle + bottom level). We provide the best certification consultancy for business continuity management system. This BCMS certification document contains well-designed set of ISO 22301 documents, which are required for making certification process easy and effective. The entire documentation in plain English is designed by a team of highly experienced consultants. It includes ISO 22301 manual, procedures, sample blank forms, SOPs, internal audit checklist and job description toolkit in editable formats. Any organization can easily modify these templates as per their company’s requirements, and within five days their entire documents with all necessary controls will be ready. ISO 22301 Manual (10 chapters and 4 Annexes). BCMS Standard Operating Procedures (19 SOPs). Sample formats for records-keeping (48 blank forms). Job description, details of authority and responsibility (18 job descriptions). Department-wise and requirements-wise audit checklists (more than 350 audit questions). During preparation of ISO 22301 documentation, these ready-to-use templates of BCMS manual, procedures, exhibits, SOPs and forms are used by many companies to establish good business continuity management system. This document kit includes mandatory procedures' templates covering all the details like purpose and scope for BCMS implementation, responsibility, how procedure is followed as well as list of exhibits, reference documents and formats. The ISO 22301 Audit Checklists, covering more than 350 audit questions are given in this documentation kit for all departments as per clause-wise requirements. By using our time-saving ISO 22301 documents, you can save a lot of your precious time and cost while preparing documentation. This document set covers complete set of documentation requirement. It takes care for all the sections and sub-sections of ISO 22301:2012 requirements that help you in establishing effective system. User-friendly documents and templates enable you to change the contents quickly and print as many copies as you need. Ready-to-use accurate formats and templates can reduce repetitive work in documentation process. You will get better control on your BCM system with our proven formats and templates developed under the guidance of our experts. Many companies are implementing ISO 22301 system under our consultancy and getting benefits of certification as improved business continuity. 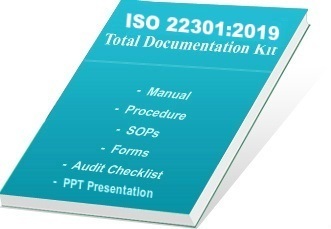 This ISO 22301 documentation kit is verified and evaluated at various levels of implementation by our team and more than 1500 hours are spent in preparation of this document set. View free Demo of ISO 22301 Documentation Kit and purchase it with secure online transaction.